Nanaimo Balls? Yes, you heard it right. That favourite Canadian treat known as Nanaimo Bars, transformed into Nanaimo Balls…perfect for the holiday season. Nanaimo Bars are a decadent, no-bake recipe made in three layers. It starts with a sweet chocolate-coconut-crumb base that is covered with a rich buttery filling then topped with a thin layer of chocolate. When I was a kid this was a special homemade treat. My aunt Marlene called hers New York Special. For me the holiday season includes time in the kitchen baking. Christmas is the time of year I pull out those special recipes, bake way too much and give generously. This recipe is a new addition to my holiday repertoire. To make a gluten free version I simply substituted Kinnikinick brand Graham style crumbs. I can easily find them with other gluten free baking supplies at most well stocked grocery stores. The center of these Nanaimo Balls is a sweet buttery mixture that includes custard powder. Birds Custard Powder is gluten free and is an egg free substitute for custard invented more than 100 years ago. It is available in the baking section and is most commonly listed as an ingredient in Nanaimo Bars. However, the long past expiry date on my tin (I’m talking years, possibly even the wrong century) made me look for another option. Many modern recipes call for packaged vanilla pudding mix instead of custard powder. This is also gluten free, is easy to find and comes in a fairly small package. I used it in the regular and mocha versions of this recipe. My third option was to not use any powder. In my very old Grand Marnier Nanaimo Bar recipe the filling uses egg yolks rather than custard powder. I hadn’t made that recipe for years but I was reminded how delicious it was when I made them again when planning this post. When making Nanaimo Bars you simply pour melted chocolate on top. For Nanaimo Balls I needed more chocolate to cover all those balls and I admit, it wasn’t easy. Does making that perfectly smooth and evenly spread layer of chocolate intimidate you? If so try drizzling the chocolate over the whole pan in two directions. It may spread and form a smooth top but I also like the lattice look, like I did on these Mochaccino Cheesecake Brownies. To make Nanaimo Balls I mixed up the order of the layers. I started with a tiny ball of buttery filling, wrapped it with a small amount of the chocolate-coconut-crumb mixture and dipped it in chocolate. Voila! Nanaimo Balls. Okay, that sounds too easy. This was a fun kitchen project but I would call it a culinary challenge. Making Nanaimo Bars is straight forward. But on matter what you make remember why you are making them. Kids and adults alike enjoy messing around with melted chocolate and creating in the kitchen. This just might become a holiday tradition in your house. Making Nanaimo Bars would be an equally fun tradition. Thanks to my friends over at Gluten Free Calgary who saw Nanaimo Balls over at the Bewitchin’ Kitchen. They wondered out loud if someone could please make them gluten free so I took on that challenge. Let me know in the comments below if you have a Nanaimo bar (or ball) story. Mocha Variation: dissolve 3 tsp instant coffee in 1 Tbsp boiling water. Orange Variation: add 1 Tbsp Grand Marnier and 1 tsp finely chopped orange zest. In a medium pot over low heat combine butter, sugar, egg, vanilla and cocoa powder. Stir until it is an even mixture and slightly thickened, about 5 minutes. Add the Graham style crumbs, coconut and pecans. Stir to combine. BARS – Press mixture into a greased, 8” square baking pan and set aside. BUTTER FILLING - In an electric mixer combine butter, icing sugar and milk until smooth. BARS – Spread evenly over the base layer. BALLS – With a 1 Tbsp size scoop make balls smooth buttery filling. Make 24-26 balls. Scoop out 1 Tbsp of filling and roll into balls. Place onto a wax paper lined baking pan. Set in freezer for 15 minutes. Remove from the freezer 6 at a time to coat with the crumb mixture. Using your hands put 1 ball into the crumb mixture bowl and press a small amount of the mixture into the ball completely covering it. Put the completed balls back in the freezer while you finish this process. Break chocolate into a bowl just large enough to hold it. Microwave on high for 1 minute. Stir then add butter. Microwave on high for 30 seconds. Stir vigorously to see if it is all melted. Repeat until chocolate mixture is smooth being careful not to burn the chocolate. Do not heat for more than 30 seconds at a time. BARS – Carefully pour chocolate over filling trying to cover as much of the pan as possible. Immediately pick up the pan and tilt it as needed to ensure the chocolate gets right to the edges of the pan. BALLS – Using wooden skewers or chocolate dipping tools carefully dip balls into the chocolate one at a time. Lift the ball out and let the excess chocolate drip back into the bowl. Place the ball onto a wax paper lined tray or baking pan. Immediately sprinkle with crushed candy canes or any decoration you want. When all the balls are coated, refrigerate until firm. Thanks for sharing that Karen. There are so many delicious variations of Nanaimo Bars. 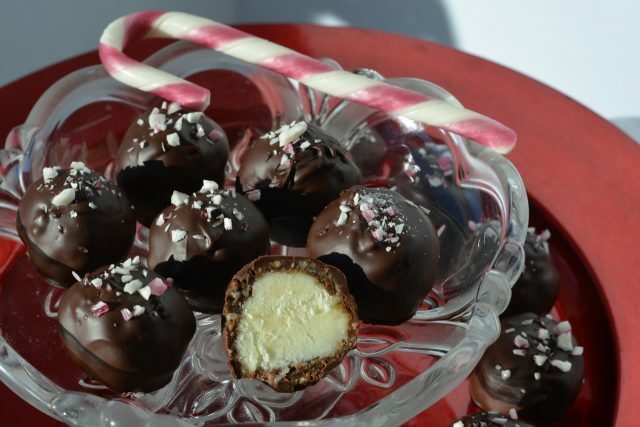 Wishing you are merry time in the kitchen making your Nanaimo Balls. I used to live in Northern Ontario, near the Quebec border. Our local grocery store made at least 8 different Nanaimo bars, butterscotch, triple chocolate, white chocolate, cherry, mint, and the three you mentioned. Thanks for the ball recipe, I am definitely making them for Christmas. My go to recipe for Nanaimo bars. Thank you!